This the earliest picture I have for Whitehall Schools. Although not dated it surely must fit the time frame of wyrleyblog’s post perfectly. I have recently been contacted by old pupil Clive Thatcher who lived in Redhouse Street and later Talke Road and attended Whitehall the same time as myself. He has very kindly sent me copies of three photographs of life at Whitehall some sixty plus years ago, these are shown along with pupil’s names at the very end of the post. Two of these three pictures were originally posted on the now defunct website, Friends Reunited. This photograph was dated as being taken in 1930 by my late mother. Some of the pupils named almost seem old friends to me as their names were frequently mentioned by my mother as I grew up. 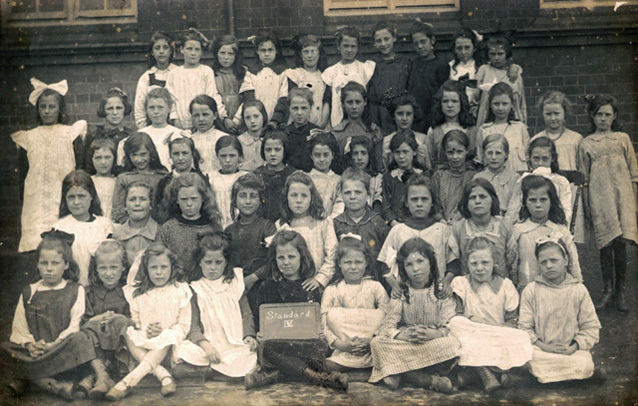 My mother, who also went to Whitehall, had the foresight to write the names of all the pupils in her class on the back of this photograph above ……all forty-five of them! Who knows, someone reading this post may come across a parent, grandparent or an aunt or uncle in this picture. Back row: Mr. Jowett the teacher, Eric Hewins, Harold Parkes, Fred Williams, Les Cox, Alfie Stride, Jack Perry, Ray Roobothan, Alfie Cooke, Norman Wellington, Jesse Richards, Joey Mayo. Second row down: Jack Turner, Dorothy Burgess, Emily Beesley, Hilda Bunch, Freda Ford, Emily Booker, Tilly Parkes, Gladys Matthews, Edna Whilly, Winnie Harrison, Doris Holland. Third row down: Margaret Careless, Marian Davies, Doreen Lunn, Winnie Hunt, Alive Hadley, Hilda Moseley (my mother), Lily Anderson, Hilda Bullock, Lois Hewines. Fourth row down: Dickie Alves, Geoff Blower, Ronnie Cooper, Jamie Roberts, Gordon Holt, Alfred Owen, Michael Read, Norman Corfield, Leslie Stride. Reclining: Doreen Bonehill, Mavis Burrows, Elsie Smith, Lillian Smith, Dorothy Dixon. 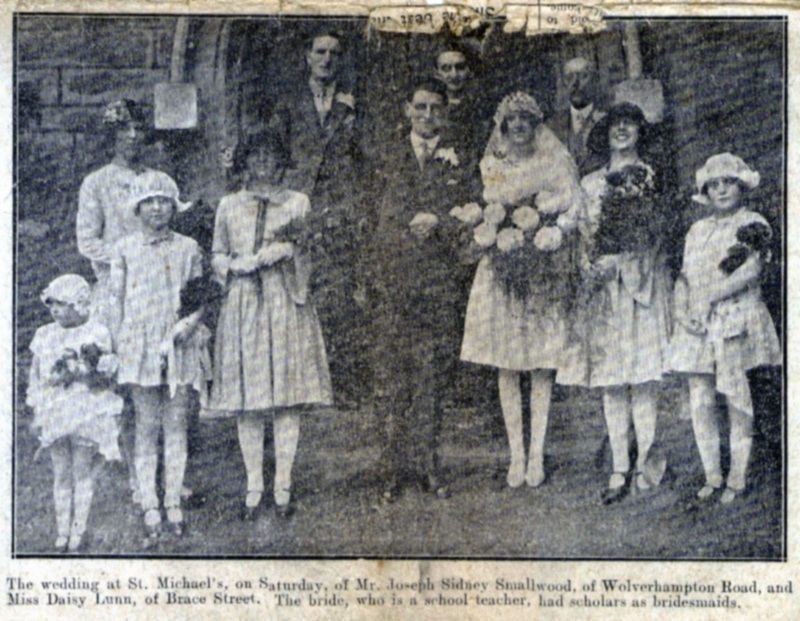 How different things were back in 1929, on 9th November of that year one of the Whitehall teachers, Daisy Lunn of Brace Street, married Joseph Smallwood at St. Michael’s Church, Caldmore and she had four pupils, my mother included, as her bridesmaids. The picture below from the Walsall Observer shows the happy group outside the church. 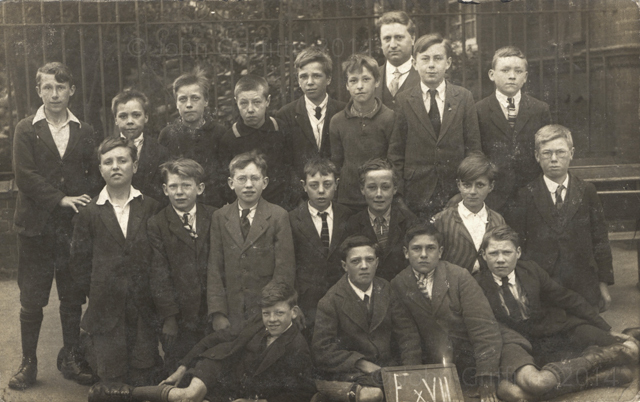 This photograph of a boys only class at Whitehall unfortunately is not dated but I would think it was taken in the early 1930s. 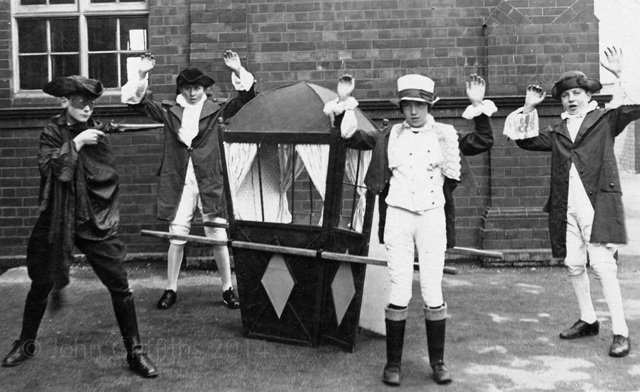 An undated and unknown play that took place at Whitehall Schools possibly in the 1940s. As an ex-pupil of both Infant and Junior departments my association with Whitehall began in early September 1952 and one of my first recollections is a memory from the first or second day. At morning break time we went into the playground and I remember standing around in a small group of boys and girls when one girl named Elaine (surname omitted to protect the guilty!) produced the biggest bacon sandwich I think I had ever seen. My dad would have struggled with one as big as that and to make matters worse for Elaine, it was by now a COLD bacon sandwich. Having struggled with it throughout the break she attempted to take it back into class with her, Mrs Bloor I think it was thought otherwise, after a bit of a battle she took it off her. Within the first few days at Whitehall we were already beginning to understand what the word discipline meant. The very early days at Whitehall Infants. 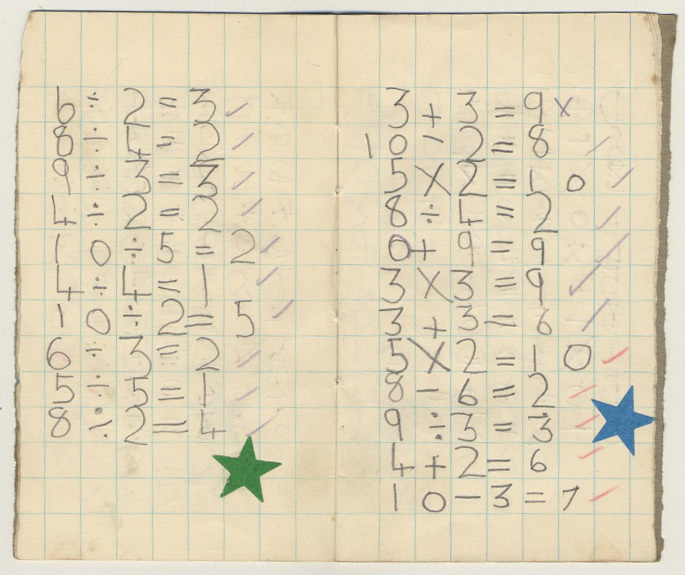 One of my exercise books from 1953 after almost completing my first year, I think in Mrs Bloor’s class. One of my ‘sums’ books from a similar period. Cannot remember the significance of the blue and green stars! The innocent looking early exercise books above turned out to be yet another lesson on the learning curve of life that was hard fought for. Sixty plus years ago it was frowned upon to write with your left hand, even if it was your natural hand. It was first noticed by the teacher when we were let loose with a bit of chalk and a small blackboard. “No John you MUSTN’T do that, put the chalk in your right hand”. Try as I may I struggled to say the least, no amount of cajoling or promise of a sweetie could convince me even at that early age that the teachers knew everything! Tears and tantrums were frequent in writing lessons as every opportunity the teachers had to embarrass me they took it. After a period of attempting every trick in the book I knew to avoid going to school my mother saw the teacher to find out the problem, even mom was told to try to make me write with my right hand! My father and his brother were both ambidextrous so it wasn’t difficult to see where I had inherited the “problem” from. The reason both my father and uncle could write with both hands was because both were probably forced to use their right hand even though both were naturally left-handed; when they were boys in the 1920s it was no use complaining as it was the teachers who had the cloth ears and not the pupils! My problem was resolved after a couple more visits from both of my parents and a letter from our family doctor. Hopefully other left-handers in the school also had an equally positive outcome to their “problem”. I can recall some of the names from 61 years ago but not all sadly, here goes:- Back row, left to right, ?, Raymond Boulton (possibly), Sandra Day, Jean Preston, Michael Dinsdale and Kenneth Butler. Front row, Angela Genna, ?, Edward Davenhill (possibly), Susan Lovick. Look at the crust on the loaf behind Sandra and Jean….bostin! 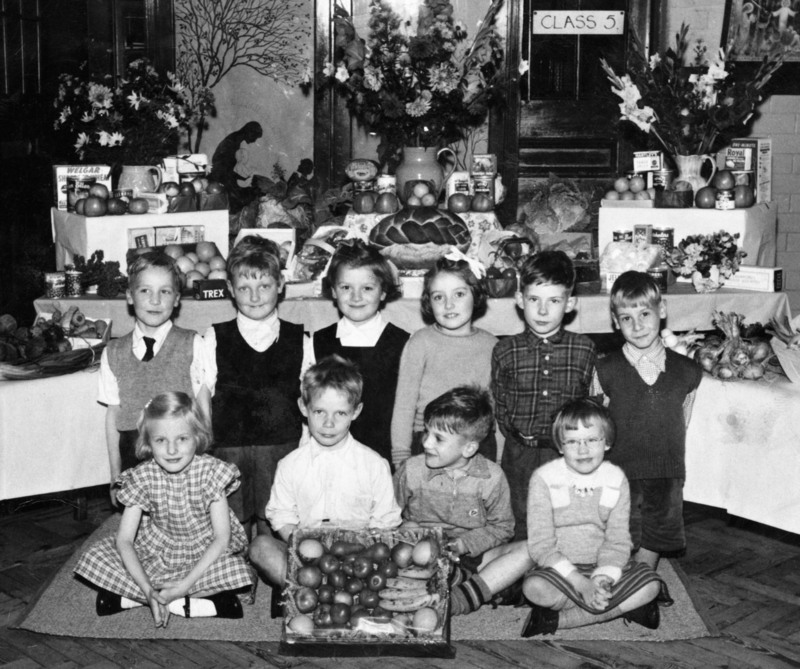 This photograph was taken in the autumn of 1953 at the start of our second year at the school. This was in the days when kids still celebrated the gathering of the harvest and come spring we all danced around the Maypole, not the grocers, the pole with ribbons on it! It must have been around this time an amusing incident comes to mind regarding plasticine! It was our last lesson one afternoon and we had all been trying to make something that resembled an animal from plasticine the modelling gunge. Again, to protect the guilty, I will just use his christian name, Brian. As home time approached our teacher, possibly Mrs Bloor, came round collecting the plasticine and she got to Brian, “may I have your plasticine Brian”, “no miss” says Brian, “why not?” came the reply……“because I’ve eaten it Miss!” When school finished for the day his mother was summoned and was advised to take him to the doctors and get some ‘physic’! We didn’t see poor old Brian until the following week fortunately looking none the worse for his ordeal. Strange how happenings from over sixty-years ago remain as fresh in the mind as if they occurred yesterday. One afternoon we were in the main hall waiting for the bell to go so that we could go home and Miss Fletcher split us into pairs and told us to throw and catch a ball with each other. All went well until I threw the ball and my partner, Kenny, missed it, it bounced once and then a second time disappearing up Miss Fletchers skirt! When the ball struck she reacted by rising on the balls of both feet emitting a small cough at the same time. This was one occasion when we were literally saved by the bell and we all made our way to our waiting mothers sniggering and giggling to each other. Looking back on the incident over sixty years later it reminds me of a scene you would expect to see in Dad’s Army……… and Captain Mainwaring couldn’t have re-acted any better than Miss Fletcher! Next to the West Bromwich Street entrance to the school was an extremely handily placed shop were we all attempted to bribe our mothers into buying some sweets. I am sure it was from here, (or it may have been Ropers a bit further up) that the ill-fated orange iced lollies were purchased sometime around 1953 or 1954. Metal foil as packaging was in its infancy back then but one company, can’t recall who, decided to wrap their orange iced lollies in this new fangle material. Sadly the people who made the foil failed to check with any medical authorities as to the effects of wrapping a delicious iced loll’ in a foil that contained quite a high proportion of lead…. yes lead! Throughout the country kids were throwing up here there and everywhere on account of having mild lead poisoning. Imagine a similar scenario today, the lawyers would be picketing school gates! One endearing image I remember from this sad event was seeing my teddy bear, reeking of disinfectant, hanging forlornly by one ear on the washing line to dry. Unfortunately he was in the firing line when I was sick! 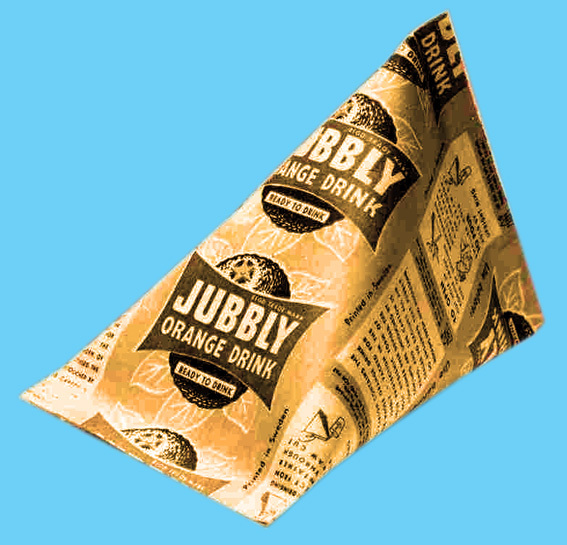 I was put off orange iced lollies until the famous Jubblys came out, an orange drink contained in a triangular-shaped carton. Some shop owners with foresight decided to freeze them and you had the biggest iced lolly ever seen, one of those floating in the Irish Sea could have been a danger to shipping! Before ripping open a corner of the Jubbly you smashed it on a wall to crush the ice so that you could start to bite into it…..God forbid if you had any dodgy teeth. Before we knew what had happened our introduction to schooling had completed its first phase and we were onto the Junior School. I decided, the reason escapes me now, that I really didn’t like the Junior School. As my mother put me in through the West Bromwich Road gate I was straight across the playground and out the Weston Street gate and back home before she had got to Fereday’s bike shop! This went on for some time, Mr. Lester the headmaster, attempted to get me through the gates by offering me a ride in his A40 Austin Somerset, a novelty in those days believe it or not! I was having none of it and come to think of it, Mr. Lester was part of the problem I now recall, he always seemed to be using “the strap” or tawse. Eventually I settled down and got on with it, what options had I? Of the teaching staff I can remember a few, Mr. Peake, Mrs Lovick (I think), Mr. Aston, Mr. Humpage, Mr. Brittle, the latter being as small as Mr. Peake was big! Mr. Peake was a good teacher who I think was in charge of both the football and cricket teams and he used to be instrumental in anything to to with school plays, nativities etc. It does make me wonder today why he wasn’t headmaster, he always seemed hardworking and had the best interests of the school at heart in everything he did. 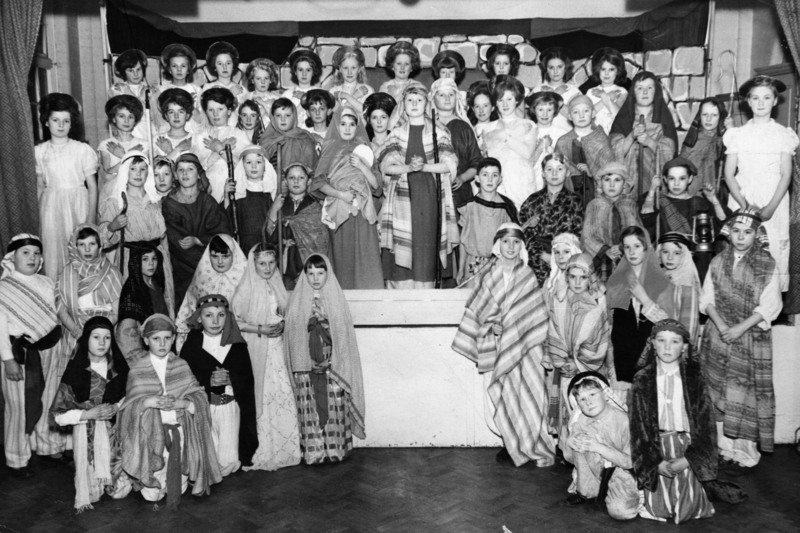 Below is the nativity play from 1957 or 1958, can’t be anymore specific I’m afraid, but I do know Mr. Peake was in charge of the production. In the photograph I am holding a crook, not a very good one actually, which I borrowed from Roger Poole, an older lad who also lived in Sandwell Street. During the cut and thrust of rehearsals, probably messing about really, I managed to break into two pieces just below the actual crook. Panicking as to what Rog’ would say I hot footed it home with the two pieces and waited for my dad to get home, if anyone could do it, he could! Sure enough he did a perfect repair, Rog’ never even noticed the join until I told him, as I was advised to do by dad! The picture of the cast is shown below along with as many names as I can recall. Back row:- Elizabeth?, ?, Sheila Cooper, Dorothy ?, ?, Janet Greystone, Jane Bridge, Zania Bottomer, Robina Willetts, Elizabeth Mold, Christine Hewins. Second row down:- Susan Levitt, Carol Morgan, Hilary Thompson, Margaret Sullivan, ?, Sandra Day, Diane Griffiths, ?, Carol Fox who played Mary, Philip Sturrock, Peter Martin, Janice Fields, ?, ?, Graham Barrows, Robert Morris, David Letts with a much better crook than my borrowed one, Diane Reynolds. Third row down:- Christopher Fowler, John Griffiths complete with crook, Stuart Ormonde, John Pitcock, Raymond Hyden, ?, Colin Fenton, ?, Brian Burgess. Left hand group standing:- Paul Coleman, ?, ?, ?, ?, Susan Horlick (I think). Kneeling;- Alan Smith, David Harper, Les Barnfield. Right hand group standing:- ?, ?, Michael Garbett (I think), ?, ?, John Russell. Kneeling:- Peter Morris, Francis Gale. Back row:- Iris Beale, Carol Gill, Margaret Clift, ?, Diane Reynolds, Gwenyth Longmore, Cherry Holford, Christine Walker. Middle row:- Margaret Allison, Anthea Willetts, Ann Allsopp, Paul Aldridge, Cheryl Longsborough, John Pitcock, Peter Jarvis. Seated:- Peter Baldwin, yours truly, Brian Burgess, Stuart Ormonde, Susan Levitt. Another of Mr. Peake’s productions was a play called Roast Pig which was put on as an end of term play in July 1958 if I remember correctly. 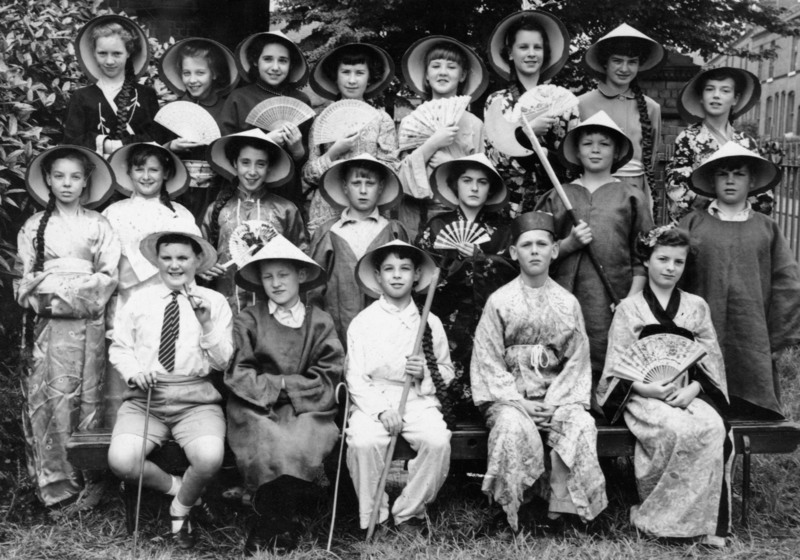 The cast can be seen in this photograph which was taken in the garden on the West Bromwich Road side of the school. This was to be our last play at Whitehall Juniors as in the following September we all moved to senior schools. If anyone reading this can see themselves or can recognise anyone else then please let me know. Thanks to old Whitehall pupil Gwenyth Childs (nee Longmore) for getting in touch and putting me right on a few names that I had forgotten. Thank you also to Pat Woolley (nee Highway) for giving me the name of Anthea Willetts on the Roast Pig picture and on the Harvest Festival picture, Angela Genna and Edward Davenhill. The three photographs that follow are the ones kindly sent to me by ex-pupil Clive Thatcher and mentioned at the start of this post. They show a PE class from 1954 followed by pictures of the cast of two more plays. Those shown above are: Girls in line on the left: Carol Morgan, Zania Bottomer, Elizabeth Mold, Rosemary ?, Hilary Thompson. Boys on the rope ladder: Peter Martin, ??, ? ?, Vivien Roper. Girls on the slide: Not known but Janet Millichip maybe one of them. Bean bag hoop: On the left: Clive Thatcher, on the right Charles Careless, Michael Ball. The large cast of the play, The Impets. Back row: Jeremy Harvey, ??, ? ?, Michael Holt, Charles Swan, Christopher Fowler, Vivien Roper, Philip Anthill, Peter (now Pierre when living in Paris) Simpson, Ian Bradbury, Colin Fenton, Peter Smith, ??. Next Row: Clive Thatcher, Roy Knight, ? ?, Margaret Sullivan, Janice Fields, ? ?, Diane Griffiths, Sheila Cooper?, Jane Bridge, ? ?, Trevor Mills, Michael Watts. Third Row: Carol Morgan, Pauline Muddiman, Hilary Thompson, Janet Greystone, Philip Taylor (now in New Zealand), ??, ? ?, Philip Jenkins, Rosemary White?, Pat Hunt, Maureen Ross, Elizabeth ? Front Row: Zania Bottomer, Christine Hewins, Margaret Coates, ? ?, Diane Cooper (possibly), ? ?, Rosemary Dickens, ? ?, Robina Willetts. Front Row: Peter Purchase, Trevor Mills, Philip Jenkins, Elizabeth ?, Pauline Muddiman, Maureen Ross, Roy Knight, Clive Thatcher, Charles Swan. Many thanks for these photographs Clive, much appreciated. Two weeks after Clive got in touch another ex-pupil familiar to both of us, Gwenyth Childs (nee Longmore), sent me a copy of the recorder group shown below. Back row, 3rd from the left is Colin Fenton, 5th is Peter Martin, then Stuart Ormonde, at the end of the line is Robert Morris. Third row, from the left, Robina Willetts, Gwenyth Longmore, Carol Morgan, 7th girl along the line is Elizabeth Mold, Janice Fields, Christine Walker and Janet Greystone. Second row, 2nd girl from the left, Cheryl Landsborough, Jennifer Cooksey, the 5th girl along maybe Margaret Phillips then Miss Malpus, the girl at the very end of the line is Hilary Thompson. Front row, 7th girl along, Elaine Harrison and at the very end of the line is Zania Bottomer. Thanks Gwenyth for the photograph, much appreciated. 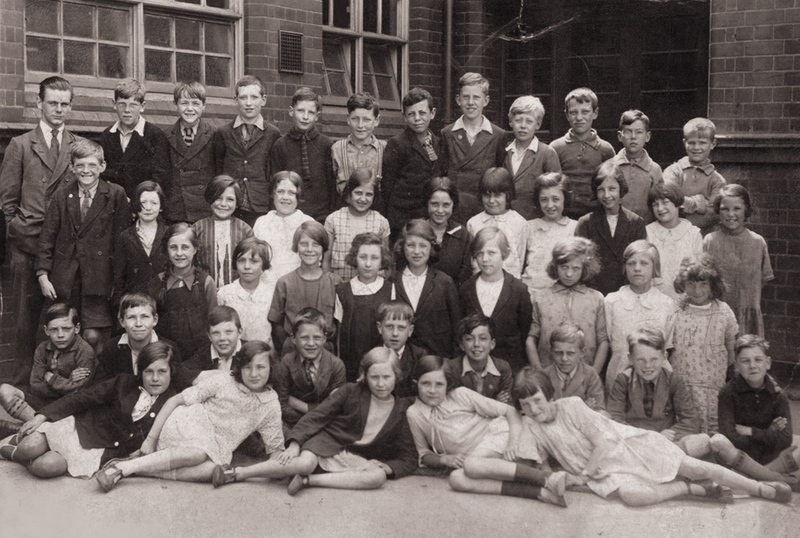 You are currently reading Whitehall Infant & Junior Schools – an ex-pupil’s memories at Walsall Life.